The first 13 episodes of the Sailor Moon R series centered around what some call the Makaiju arc. Though unpopular amongst some fans due to not being based on a manga story, the arc offered some great original characters and a lot of good episodes in this short contained story. Comedy was frequent in these episodes, and this one is a prime example of that. The main focus of this episode is a production of the play Snow White. Mamoru has his entire theatre troupe flake out, leaving him needing to do a play, which Rei suggests be Snow White. This causes endless bickering as all of the girls think they should be Snow White, all giving their own reasons for this, including Makoto who thinks she should play the part because she has the biggest breasts. The role is decided by Natsumi who suggests they draw strings. 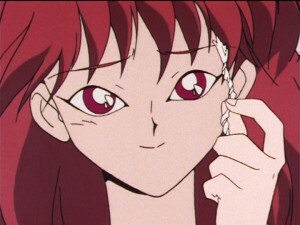 She draws the white string by cheating, because she wants to kiss Mamoru, and make him fall in love with her, just like in the play. 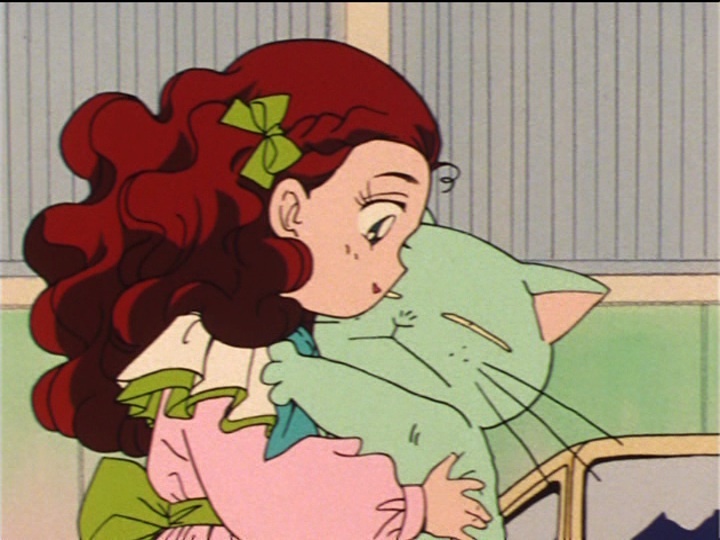 Throughout rehearsals Natsumi, who we also know as the alien Ann, keeps trying to kiss Mamoru, which angers Usagi, who got stuck being the witch. The rest of the girls along with Naru and Umino get stuck wearing animal costumes which clash with the theme of Snow White pretty drastically. 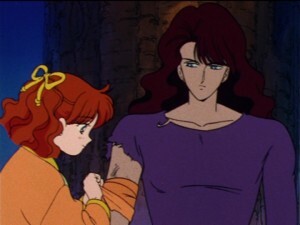 Natsumi courting Mamoru is a pretty major theme of this story arc, and things get pretty intense in this episode as she makes her intentions to do so extremely clear, causing Ail to be quite jealous and to send the monster Pierrot to attack the play, ultimately foiling Ann’s plans. 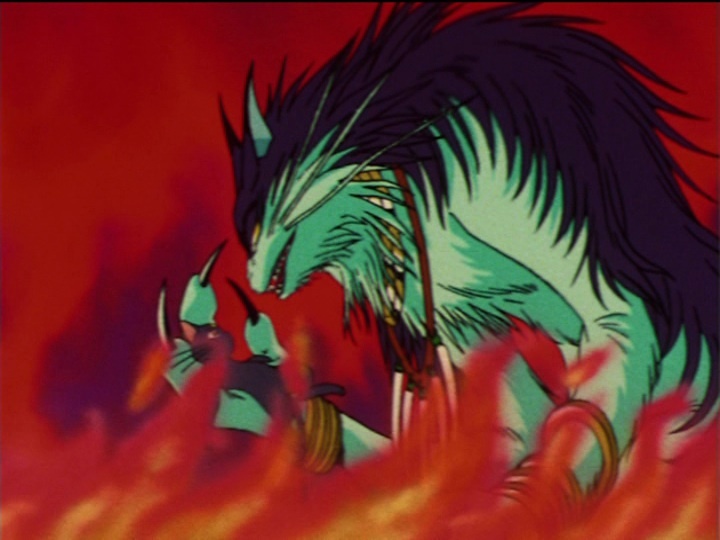 We get a clear picture of the dynamic between the two at this point, as their chasing down Usagi and Mamoru tears them further apart, which unbeknownst to them only worsens the condition of the Makaiju, their tree, which they are trying to protect and restore. This episode is tons of fun, with a lot of silly gags. 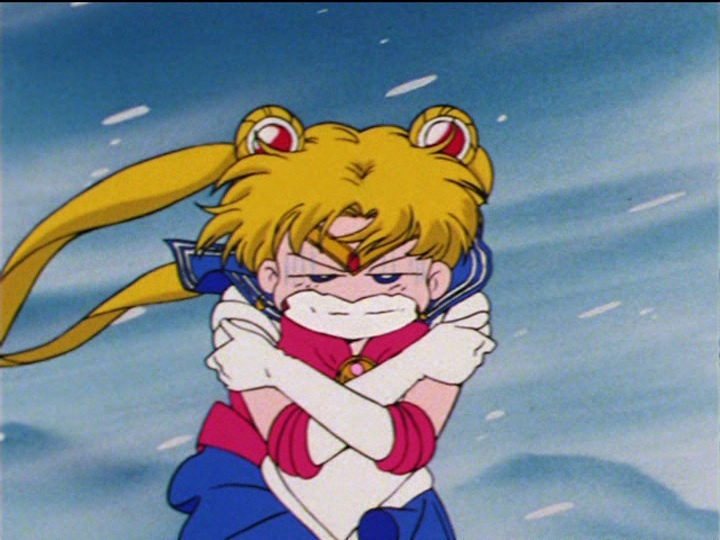 Sailor Moon is no stranger to silly episodes, and this one is a great example of that. A sub plot at this part of the series was the search for the 7 Rainbow Crystals, found within the bodies of people who had been given super powers because of them. This time around, it’s not in a person at all, but in a big, adorable, courageous cat named Rhett Butler, who’s named after a character from “Gone With the Wind”. The episode opens with Luna being attacked by alley cats, and Rhett Butler coming to the rescue. 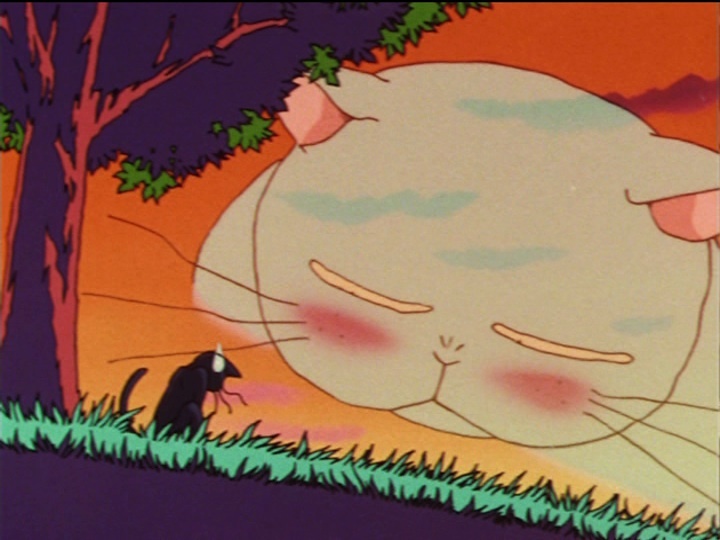 He is portrayed essentially as the Tuxedo Mask of cats, and these super abilities and a precognition when Luna is in danger can probably be attributed to the Rainbow Crystal that is inside him. 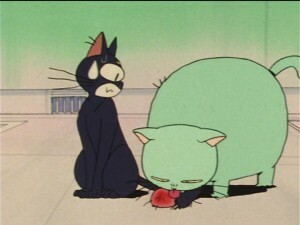 That’s just the ability, Rhett Butler’s real greatness comes from what he does with that ability, putting it all on the line for that black cat that he protects. 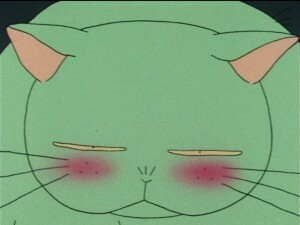 Rhett Butler is himself no alley cat. He belongs to a young girl who’s parents are conveniently missing for the whole episode. 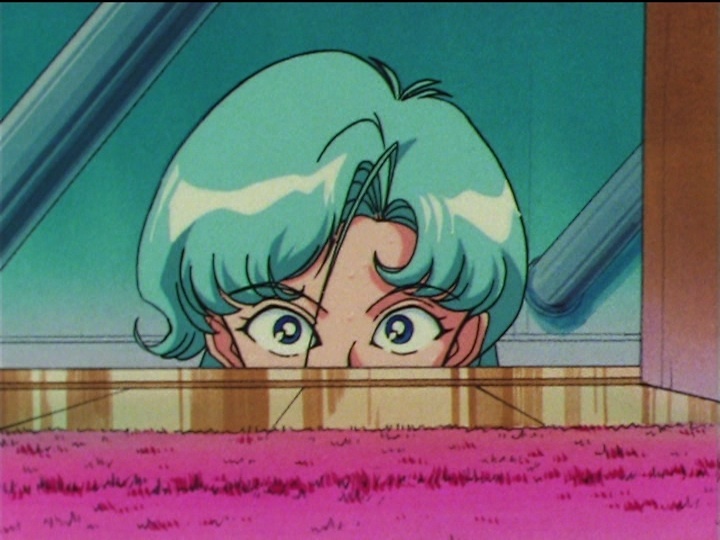 As both Zoisite and Ami are tracking this Rainbow Crystal, they both assume the girl is the one with the crystal, though Rhett Butler once again escapes to help Luna when she is being protected by Usagi and her friends. 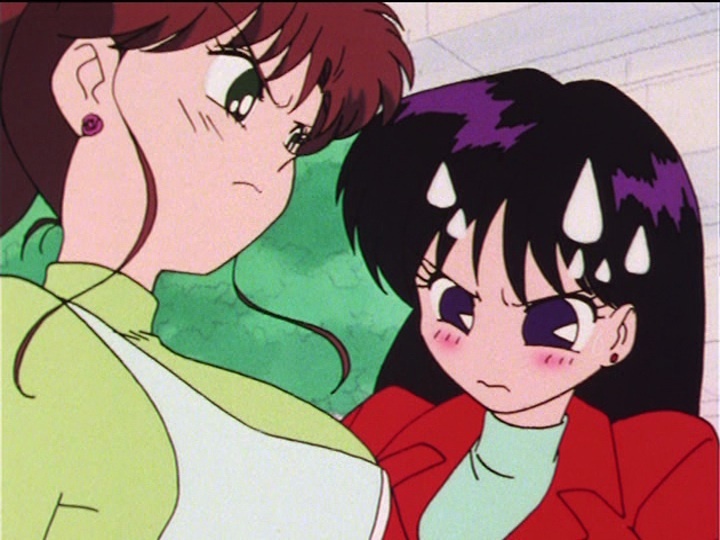 The Sailor Soldiers run into Zoisite in an alley and trying to fight him end up stepping on each other as Ami falls over and Makoto blushes after looking up her skirt. Zoisite quickly determines the cat to be the real host to the Rainbow Crystal and follows him through the sewers, having a creepy encounter with a ton of rats in the process. The gang is late to the party, realizing too late that the girl is not the one they’re looking for, but in the mean time Zoisite extracted Rhett Butler’s Rainbow Crystal causing him to become the monster Bakene. Showing a mental strength stronger than most human Rainbow Crystal carriers he has a moment of lucidity even in his state as he protects Luna once again. Once returned to his natural form, Rhett Butler returns to his owner, and the rest of the girls pester Luna about her relationship with him. Though Luna denies any attraction, she ultimately remembers him quite fondly. 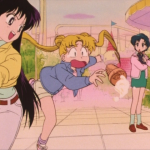 This hilarious episode shows that even without any real advancement to the main story Sailor Moon had some really great individual episodes which held their own, and that single appearance characters frequently left a lasting impression on fans. 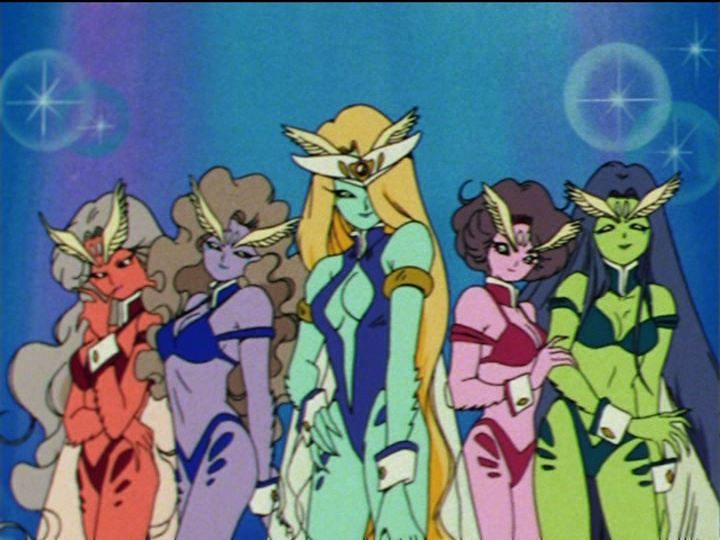 Sailor Moon has a bad reputation for having standalone filler episodes, which don’t advance the plot much, and the SuperS season is filled with these. Though the individual episodes are quite great, the season very rarely dealt with advancing the plot, though in the odd cases where it did, it did a stupendous job. This episode is one of those rare examples. 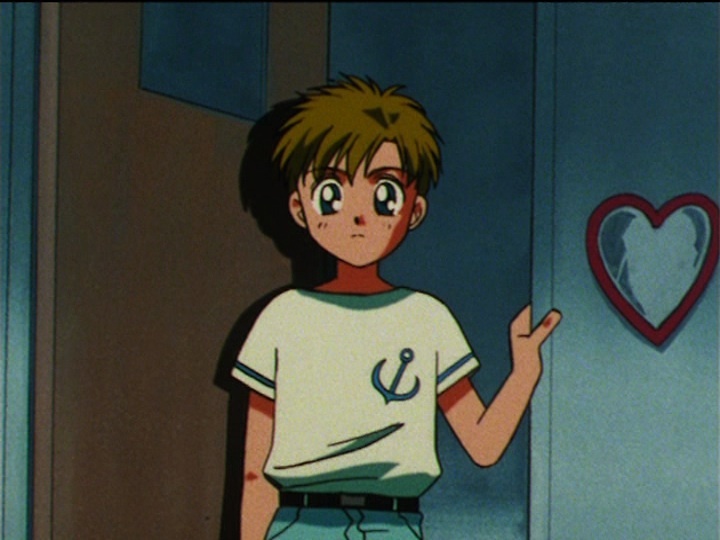 This is the second part of a two part episode where in the first part Fish Eye, of the Amazon Trio, targeted Mamoru, but his advances were rejected as Mamoru tells him that he doesn’t have any dreams. 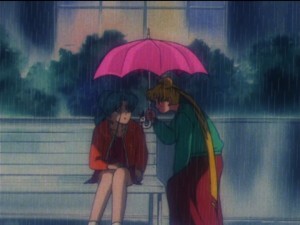 As the episode begins Usagi finds Fish Eye in the rain and takes him in. 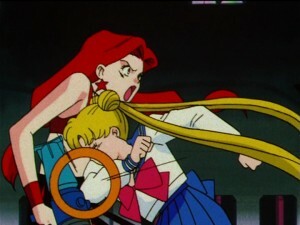 This is a prime example of Usagi’s strength. Not only has she shown time after time that she can forgive and show love for villains, but here she does it for who she assumes is an unknown girl after her boyfriend. 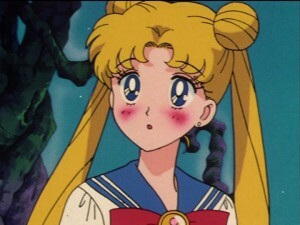 In talking with Fish Eye, Usagi reveals her dream of being with Mamoru and in talking about him says similar things that Sailor Moon had, causing Fish Eye to figure out her true identity. 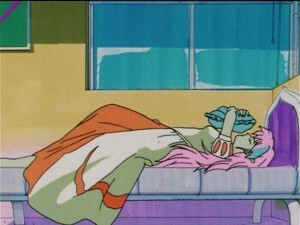 To top it off, he catches ChibiUsa talking with Pegasus, who they’ve been looking for all along. Fish Eye confronts Ziriconia, asking if they can really become human when they catch Pegasus, which causes her to attack Fish Eye. 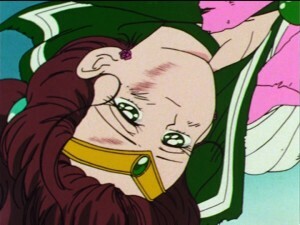 Assuming Usagi was the one with Pegasus, Hawk Eye attacks her and reveals her Golden Mirror. The monster Mr. Magic Pierrot gazes into it only to discover that Pegasus is not there, and so he turns his attacks on the Amazon Trio as Ziriconia had requested. In trying to attack the Trio Mr. Magic Pierrot destroys Usagi’s Mirror of Dreams, leaving her in a kind of soulless, catatonic state. He then attacks Fish Eye again but Hawk’s Eye takes the hit and ultimately dies. 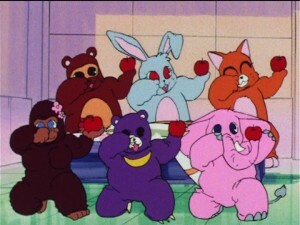 Tiger’s Eye and Fish Eye decide to give up their lives in human form to resurrect Usagi and free ChibiUsa so that she may defeat Mr. Magic Pierrot. The Amazon Trio die, leaving only animals in their place as their true identities are revealed. 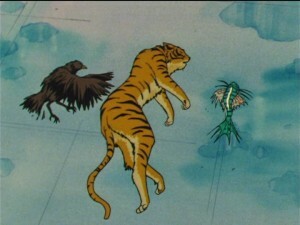 Hawk’s Eye is a Hawk, Tiger’s Eye is a Tiger and Fish Eye is a Fish. 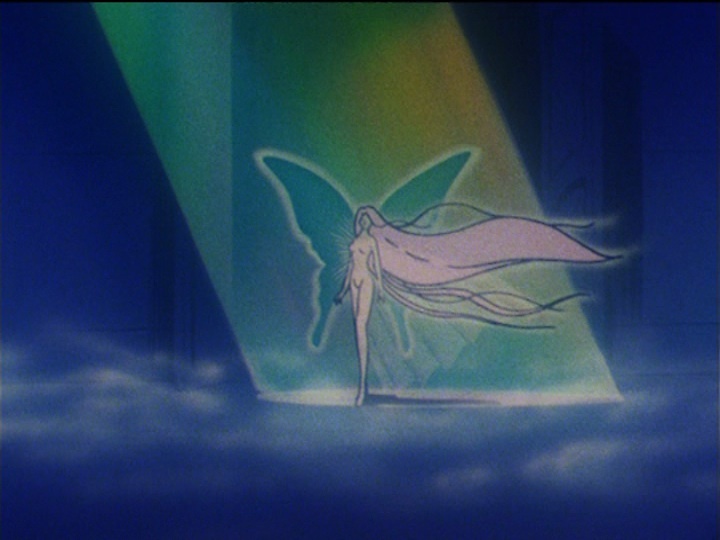 Pegasus immediately appears and not only return the Amazon Trio to their human selves, but also gives them their own Mirrors of Dreams, in essence giving them souls, and takes them back to Elysion to stay until the light returns to the forest. It’s not entirely clear if the Trio are actually dead or alive at this point. While they appear to have been resurrected, they are shown surrounded by glowing sparkles in human form and are then turned into balls of light which enter their Mirrors. This can be interpreted as their spirits passing on into Elysion as a form of afterlife. This episode and the one preceding it give a great amount of depth to the Amazon Trio, who previously were shown as little more than a group of players and are now shown as heroes who sacrifice their lives for a worthy cause. We are made to care for them just in time for them to be taken away. 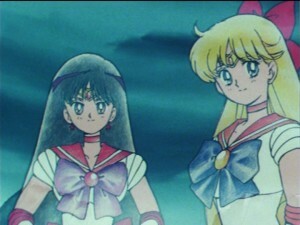 This episode, from around the middle of the Sailor Moon S season, features a lot of story development, but it is told at an odd pace, and the episode is composed visually in a very unique way. There are a lot of long shots with little motion, series of stills and even weird colourations on certain shots. The end effect gives the episode a very artistic feel which sets a very different tone which is fitting to the subject matter of the episode. The story centers around the discovery of the true location of the Talismans. It is known only that the Talismans exist in a person with a Pure Heart, and the Death Busters have been looking for that person all season. Eudial discovers the identity of those that have them, and upon learning this she calls Haruka and Michiru so that they can meet. Haruka and Michiru are troubled, because they know that they will have to kill those who have the Talismans in order to save the world. Usagi is at odds with this plan and so they arrange a meeting with her, in which Haruka steals her transformation broach, leaving her incapable of transforming into Sailor Moon. They then leave to meet with Eudial. Eudial has set a number of traps for Sailor Uranus and Neptune. Neptune is quickly captured, and Uranus is riddled with bullets while trying to come after her. 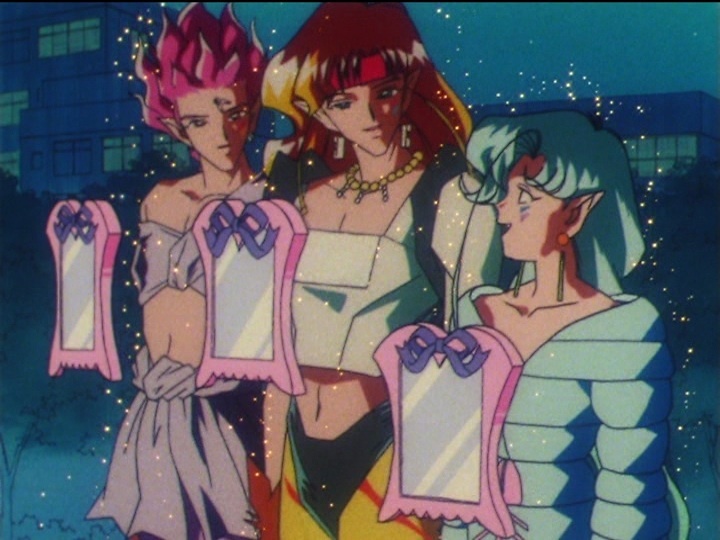 Eudial reveals that those who have the Talismans are actually Sailor Uranus and Neptune. Trying to protect Uranus, Neptune runs at her, getting shot by numerous bullets on the way, and is finally shot by Eudial with a gun she has which extracts her Pure Heart, and leaves her essentially dead. Uranus’s Pure Heart then transforms into the Deep Aqua Mirror, the first of the Talismans. 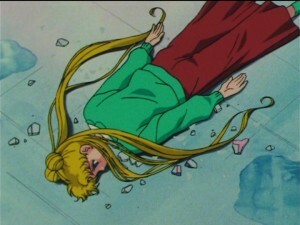 Usagi arrives, as herself, still unable to transform. As she does this light shines through a butterfly shaped window causing Usagi to appear as the Messiah in the eyes of Haruka. Showing her courage and willingness to protect her friends, even in the face of unsurmountable odds, she charges at Eudial, knocking her out of the way. 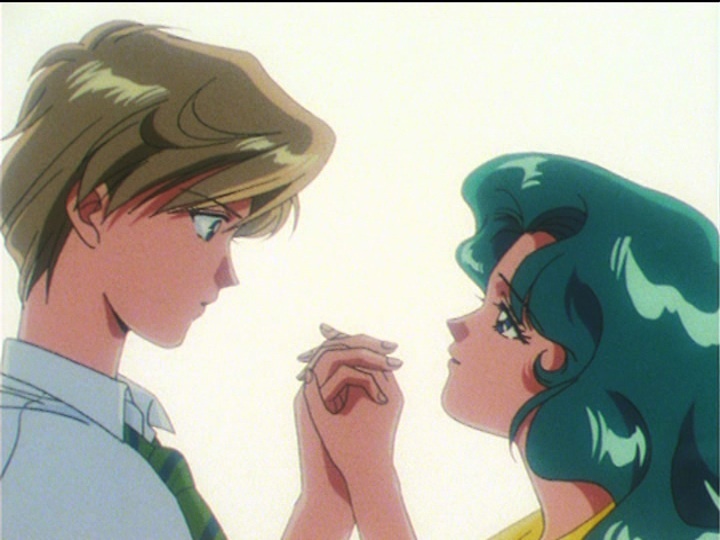 She then tries to put Michiru’s Talisman back into her to revive her, but Haruka won’t let her. 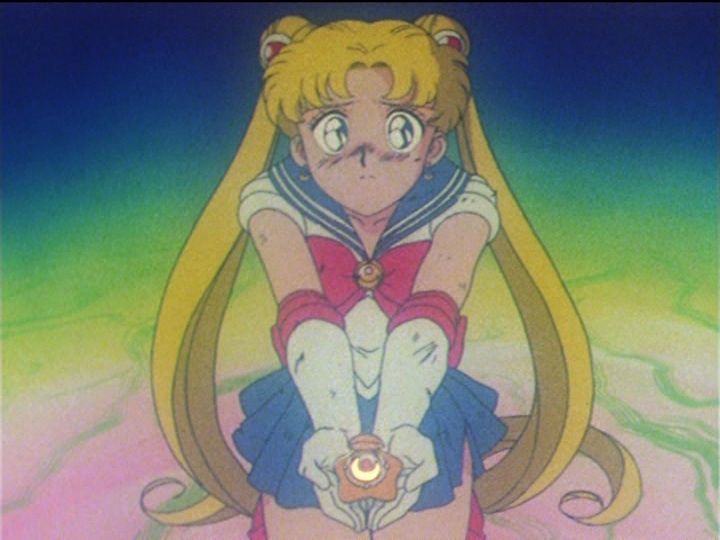 Haruka returns Usagi’s broach to her, as Usagi insists she can save the world without the Talismans. 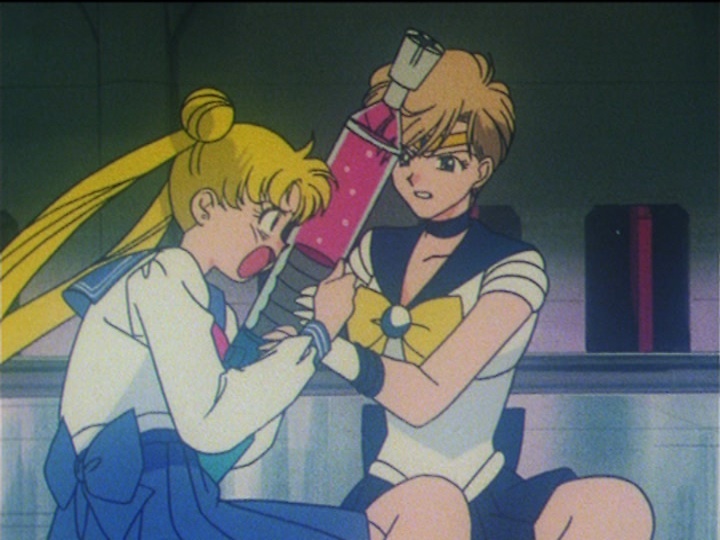 Haruka says she briefly thought Usagi was the Messiah and almost believed her, but ultimately didn’t, and so she turns the gun on herself, killing herself and revealing that her Pure Heart is also a Talisman, the Space Sword. 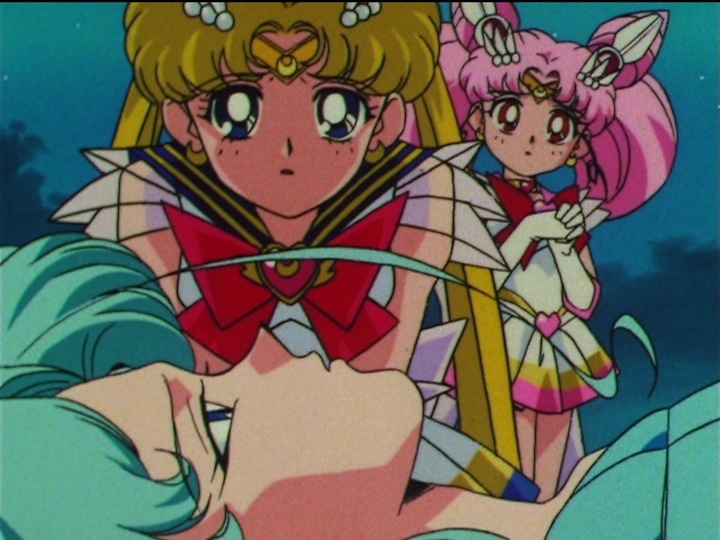 The rest of the girls and Setsuna arrive to find Usagi sobbing over Sailor Uranus and Neptune’s bodies. In the next episode Sailor Pluto manages to revive the two girls, but at the time of seeing this episode for the first time it was from a fansub of episodes taped off of TV that I had, and it was years until I saw the next episode, and even longer until I saw how this season played out. 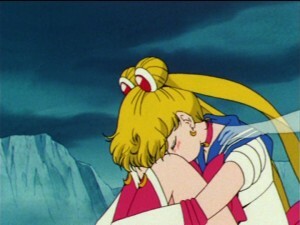 Surely not many people really die for good in Sailor Moon, but the emotion of the scenes as they happen are still quite effective. This is the first episode in the two part finale for the first season. It’s hard to consider them separately, needless to say both are great. 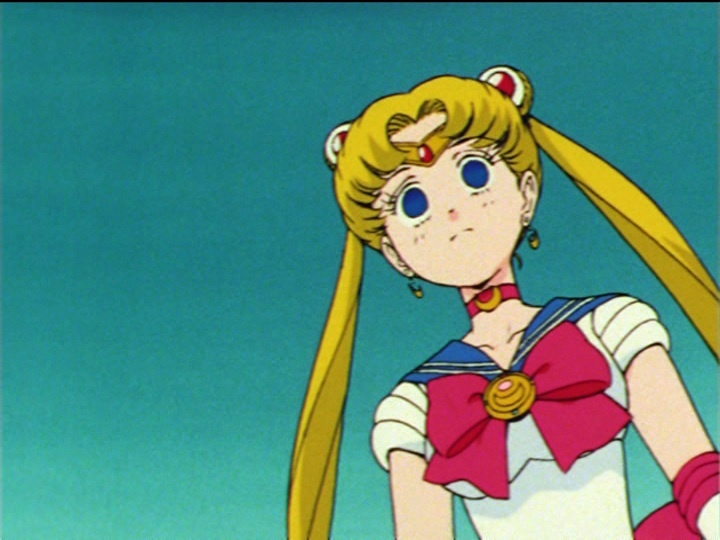 Essentially what happens in this episode is that Sailor Moon watches all four of her friends die. Not in one swoop, but in individual, personal, graphic deaths. Hard to watch, but masterfully executed and extremely emotional. Having discovered the location of the D-Point in the North Pole, the girls travel there by using Sailor Teleport. It’s cold in the North Pole, and the girls are wearing nothing but mini skirts, but they soon get over it as they’re attacked by the DD girls. 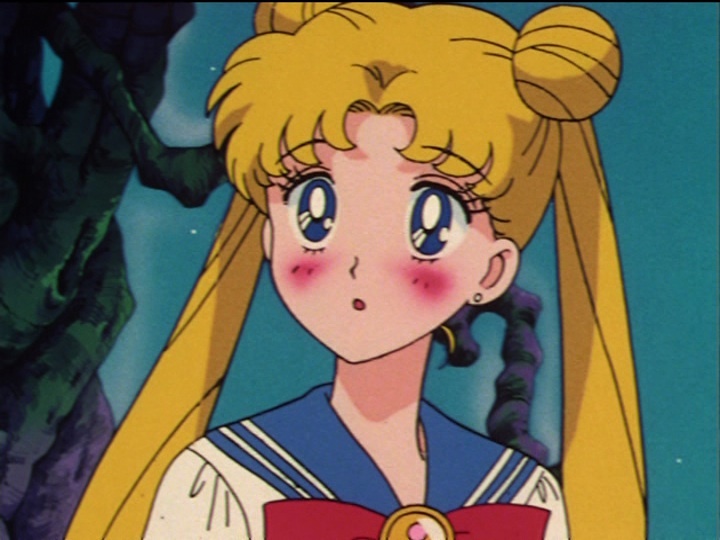 They begin to use illusions to tempt them starting with Sailor Moon, who naturally falls for them even when told what they are. When Sailor Jupiter is confronted with an illusion of Motoki, she can’t help but run to him and by falling into this trap she is grabbed by the DD Girls. Seeing no other option she uses her Supreme Thunder attack and kills two of them, but not without fatally injuring herself. 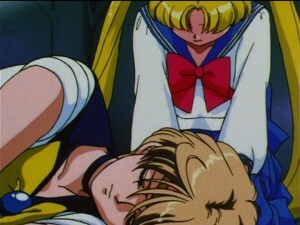 Usagi is in disbelief, telling Makoto that they have to go back and fall in love, but she dies. Usagi is ready to give up and give Beryl her crystal, because she can’t accept her friends dying. Sailor Mercury slaps Usagi in the face, telling her that Makoto can’t have died for nothing. When her computer detects something, Ami stays behind encouraging the group to go on ahead. She is faced with the image of Urawa, but quickly determines it’s an illusion, and pinpoints the source to a gem on one of the DD Girls’ foreheads. As an explosion comes toward her she protects herself in a bubble, and as she’s being attacked she uses her last bit of strength to break the illusion causing gem with her computer, and then dies. While Ami was unable to defeat any of the DD Girls, she is able to give the other girls a strategic advantage. Ami’s death is felt by Usagi, Minako and Rei. Sailor Venus spots something moving under Sailor Moon, and pushes her out of the way, sacrificing herself to save her life. 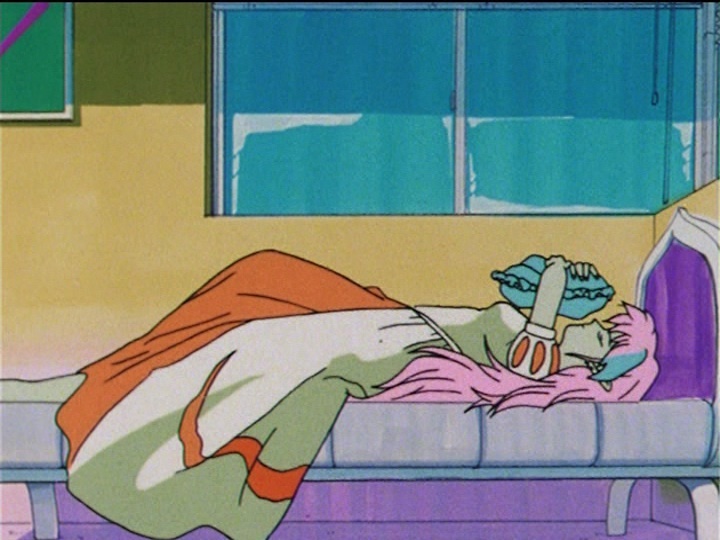 She uses her Crescent Beam on one of the DD Girls, killing her and then dies herself. This leaves only Usagi and Rei, the unlikely friends who despite arguing constantly have been shown time and time again to have a strong bond which I have always felt is the strongest of the show. 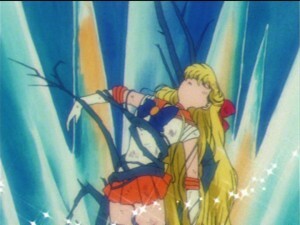 As the two remaining DD Girls attack Sailor Mars she is enveloped by a mountain of ice, which appears to kill her. As a DD Girl emerges to attack Usagi, all hope seems lost. 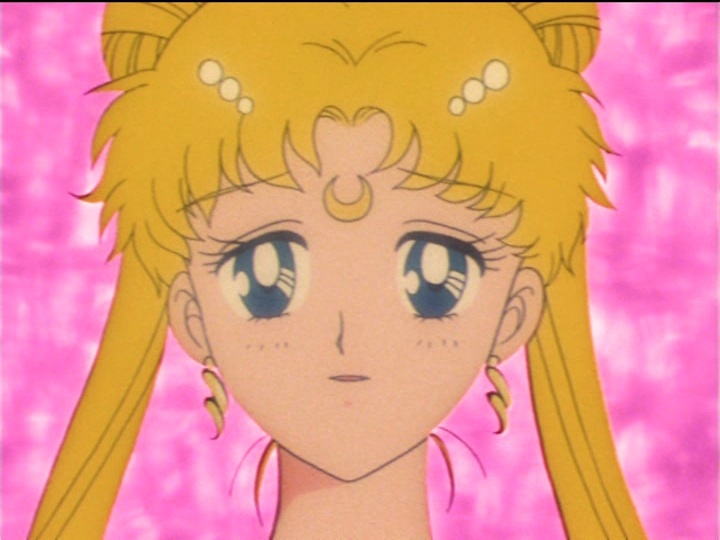 A flame erupts from the mountain killing the DD Girl that was threatening Sailor Moon. An unseen fight occurs inside the mountain, and the final DD Girl emerges and discards Sailor Mars’s defeated body. Barely able to move, Rei grabs her foe’s tentacle and uses her Fire Soul attack not to shoot a fireball at her, but to send it up the tentacle up to her body, killing the final DD Girl. 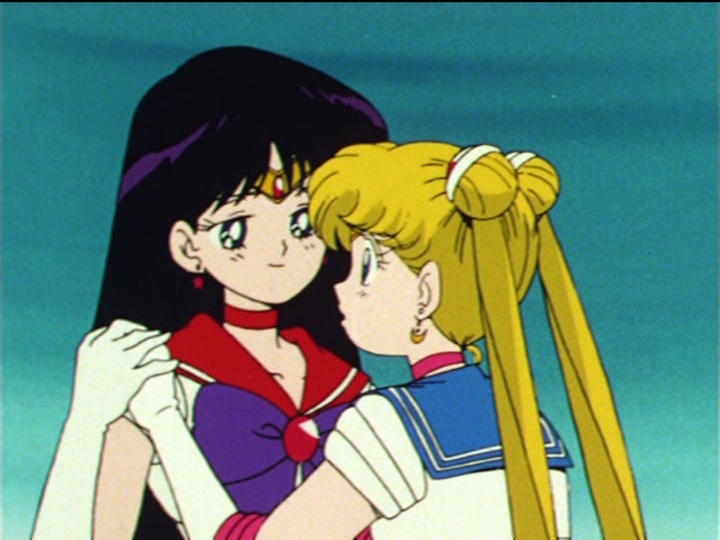 Rei tells Usagi that she regrets not being able to kiss Yuichiro and dies. With all her friends gone, Usagi puts her head between her knees and sobs, but then she feel a touch on her shoulder. Her friends, as ghosts, appear to encourage her. 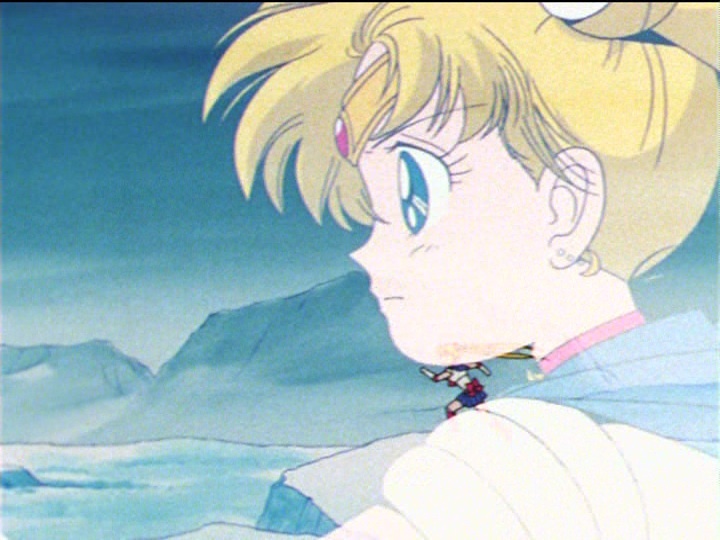 Usagi runs off, to rescue Mamoru, to confront Queen Beryl and to save the world. Sailor Moon kills it’s heroes all the time, and they usually come back. The deaths in this episode were still very effective. 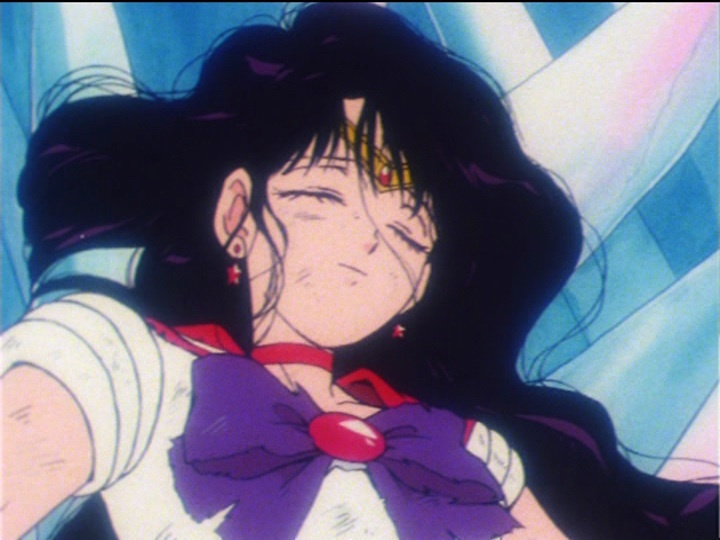 While Sailor Moon does ultimately use the power of her Crystal to bring them back, they did die for some time, and return with the memories of doing so. To be perfectly honest, if I had to rank all episodes in order, my top 5 would probably all have been from the first season, but I wanted to add a little variety to the list. With that in mind, here would be the other episodes from the first season which would have been part of my 5 favourite episodes were I not trying to balance things out. You have probably noticed from my list that I’m a sucker for episodes when characters die, and this is another fine example of this. 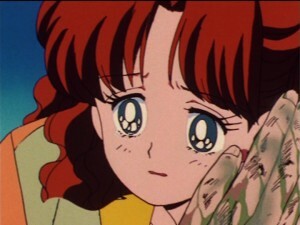 Deaths are treated so powerfully in this show, and when Nephrite dies in Naru’s arms, we feel her pain. 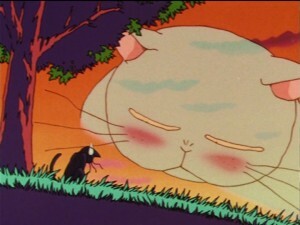 Here is a horrible villain, transformed by the power of love, such a fitting story for the Sailor Moon show. 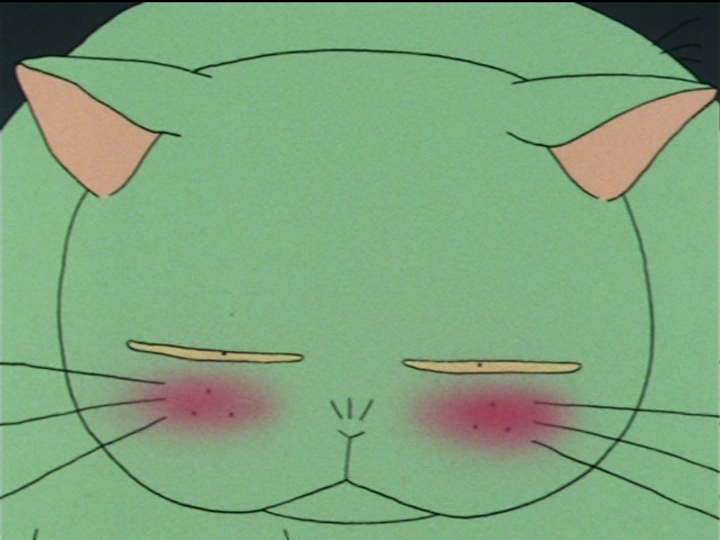 The effects of his death continue for a number of episodes as Naru morns him and ultimately finds comfort in her friends Usagi and Umino who help her work through it. This is the episode that got me hooked on the show. 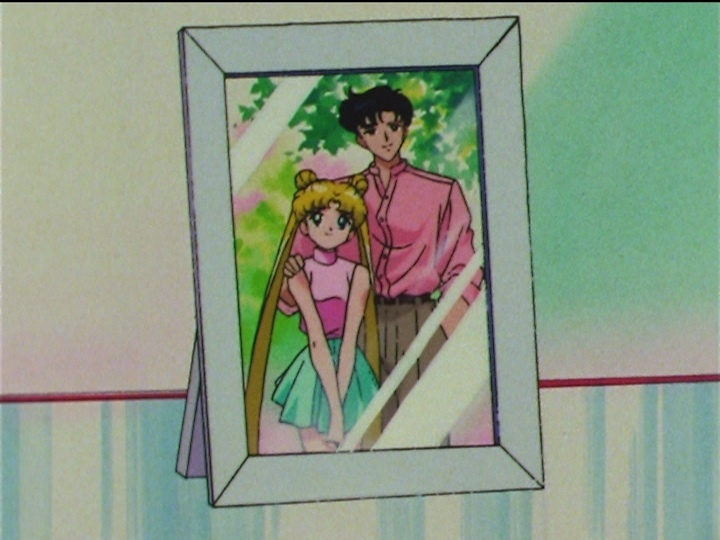 I tuned in early for something else one morning and caught the final act of this show, where Mamoru and Usagi learn each other’s identities and the Moon Princess is revealed. Such important scenes are told to us so well in this great episode which more than any other shows the relationship between Mamoru and Usagi developing independent of their destinies. I wanted to include both episodes 45 and 46 as my top two favourite episodes, but I avoided doing so because it would have been too much of the same thing. This epic ending to the first season truly is the greatest season finale of all time. Usagi’s struggle against Endymion is heart wrenching, as she watches him die, and ultimately dies herself in defeating Beryl. Despite all this hardship, the end of the episode leaves us with a strong feeling of hope, as the girls regain normal lives, but at the price of their memories of each other. This could have worked as a series finale in many ways, either leaving the characters dead, or continuing with this ambiguous ending as it is. Ultimately we’re better for having gotten more seasons, but I believe that this first season as a single contained story, truly is the greatest story arc ever told on television. 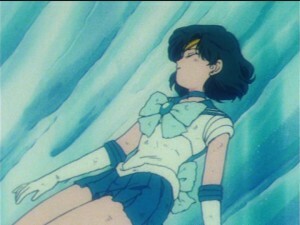 This entry was posted in Sailor Moon Anime (1992) and tagged Rhett Butler, Sailor Moon episode 24 - Naru’s Tears: Nephrite Dies for Love, Sailor Moon episode 31 - Love and Chased: Luna’s Worst Day Ever, Sailor Moon episode 35 - Returning Memories: Usagi and Mamoru’s Past, Sailor Moon episode 45 - Death of the Sailor Guardians: The Tragic Final Battle, Sailor Moon episode 46 - Usagi’s Eternal Wish: a Brand New Life, Sailor Moon R, Sailor Moon R episode 56 - Steal a Kiss from Mamoru! 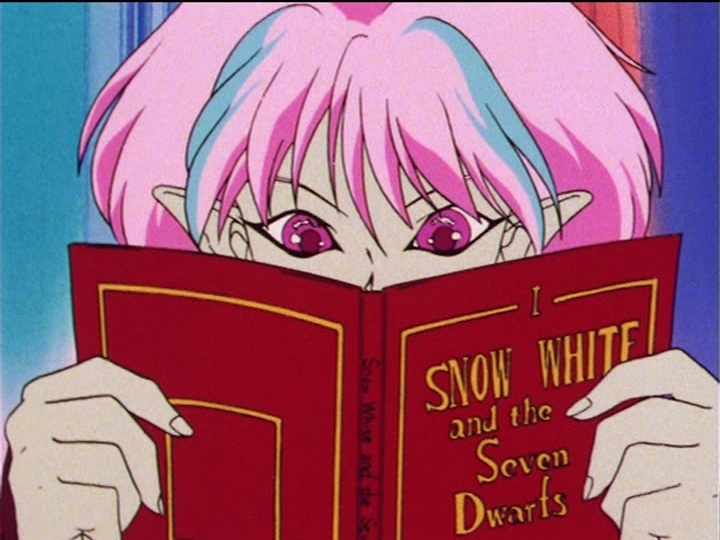 An’s Project Snow White, Sailor Moon S, Sailor Moon S episode 110, Sailor Moon Season 1, Sailor Moon SuperS, Sailor Moon SuperS episode 149 by Adam. Bookmark the permalink. 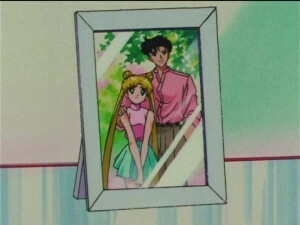 I was always more invested in the bond between Rei and Usagi than in the relationship between Usagi and Mamoru. 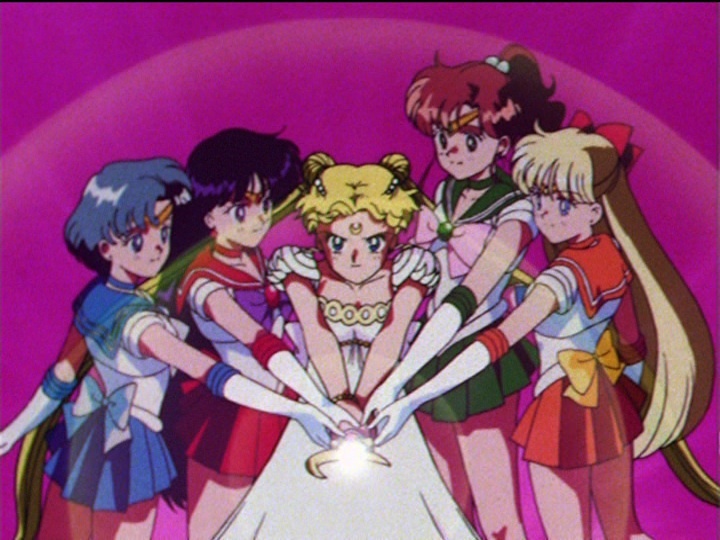 to me the final few episodes of season 1 are some of the best moments among my SailorMoon memories. 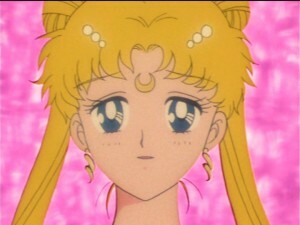 thank you again for reviewing my very special memory of Sailor Moon.